The Colorado House is holding its first hearing this afternoon on the state’s oil and gas bill. The “Boulder Bill” passed through the Senate last week while a blizzard effectively shut down the rest of the Denver Metro area. As a quick recap, the bill would drastically change many regulations governing the oil and gas industry in Colorado. These changes include updating the mission of the Colorado Oil and Gas Conservation Commission, giving localities the ability to institute stricter rules than the state, and pausing permitting until rules on health and safety go into effect (which could take months or years). Many voices from across the state are raising concerns about the bill and how it’s raced through the state legislature—first being released at 5 p.m. on a Friday and then progressing through three separate hearings within a week of one another. On Friday, oil and gas workers rallied in Greeley, where the crowd heard from a variety of speakers who gave their own perspective about how the oil and gas industry impacts them. Bob O’Connor, CEO of the Weld Food Bank, gave specific examples of when companies stepped up to help fund needs of the organization. Noble Energy paid to replace vital trucks that are used to transport food to those who need it, while NGL Energy paid for a new oven in the group’s commercial kitchen, which upped its capacity by 500 meals per hour. O’Connor also pointed to the 10,000 volunteer hours dedicated by oil and gas workers. He expressed concern about the possible impact that a decreased industry presence could have on the non-profit. Terry Adams, director of the Boys & Girls Clubs of Weld County, also talked about the outsized impact the oil and gas industry has on his organization. We will be hearing from more voices during testimony in the House Energy and Environment Committee. 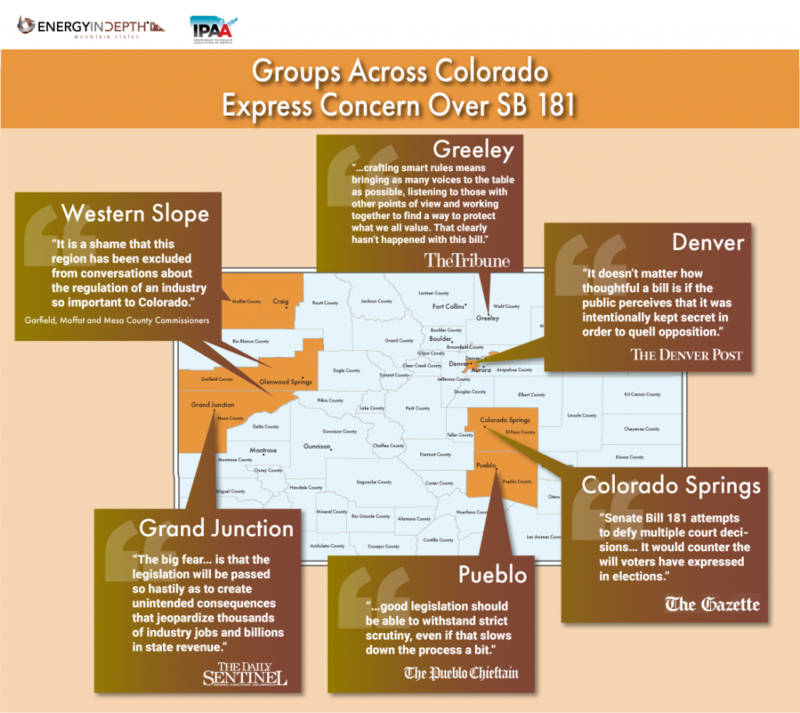 Check EnergyInDepth.org and follow @EIDMtnStates on Twitter for more updates on SB 181.